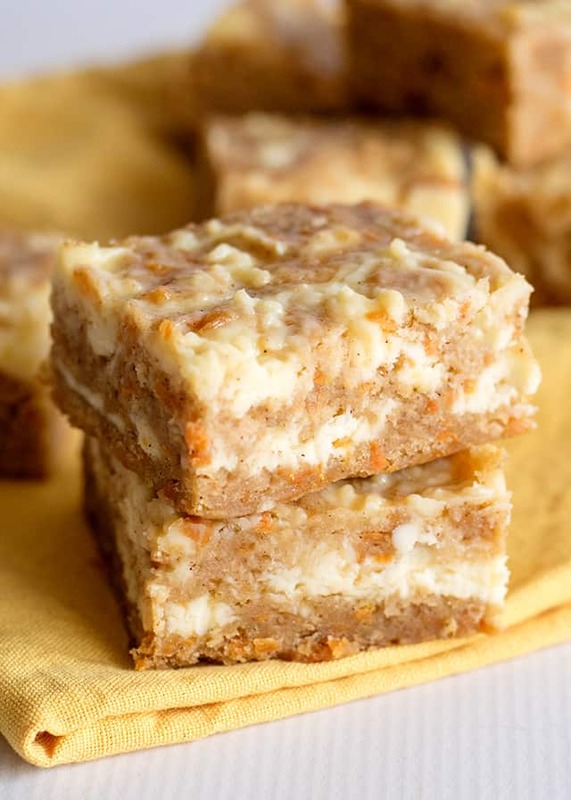 These carrot cake bars are so moist and delicious! They have a sprinkle of cinnamon and a cheesecake swirl in them. They make a great Easter dessert. If you love carrot cake, I have a carrot cake with caramel frosting recipe that’s to die for. I tend to make carrot cake inspired recipes a couple of months out of the year. The first being around Easter because I associate carrot cake with Easter and the second time when the carrots in my garden are ready and/or I find some at the farmers market that are calling my name. 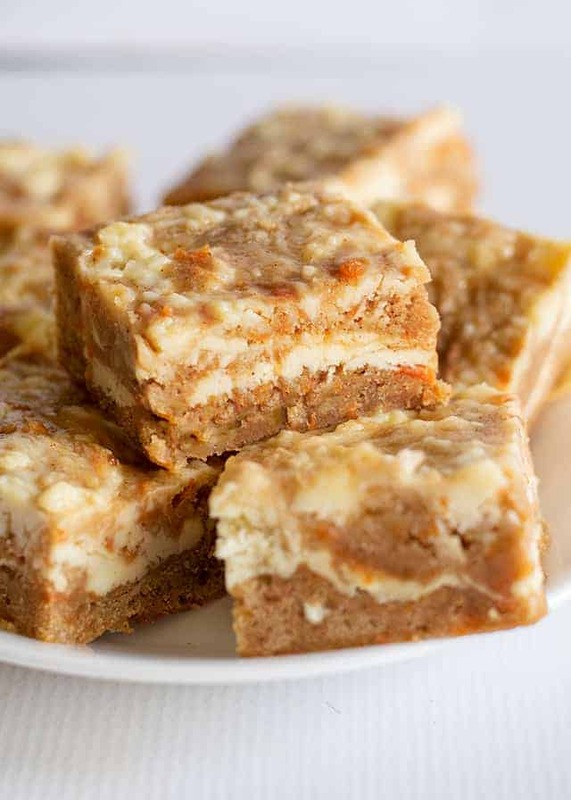 This Carrot Cake Bars Recipe is the first of several that should be coming out in the next week or sooner! It’s made completely from scratch and has a blondie feel about it. 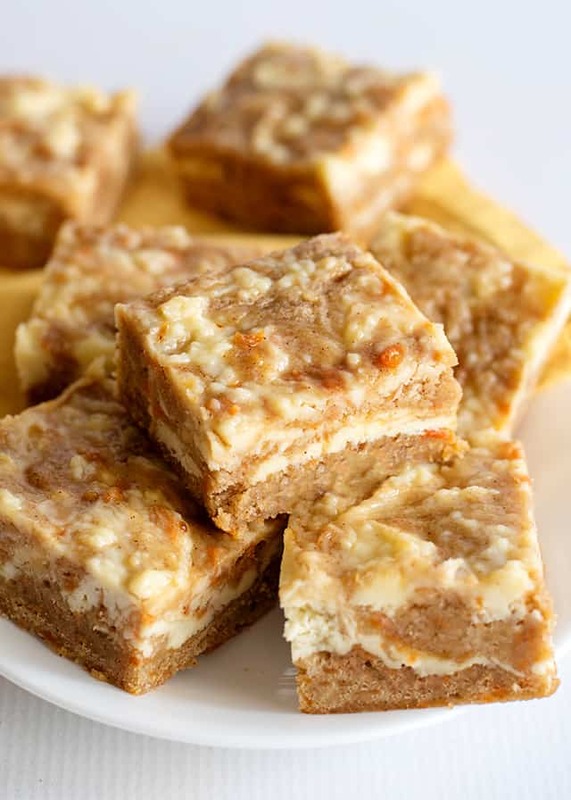 There’s a generous swirl of cheesecake in it instead of adding a cream cheese frosting to the top of the bars. butter – I used unsalted butter and added salt to the recipe. Don’t worry about letting the butter come to room temperature, it will be melted instead. brown sugar – Light brown sugar is recommended for this recipe, but dark will do in a pinch. It may provide a more dense bar as there is more molasses in it. eggs – always use large eggs unless the recipe specifies a different size. You’ll need a whole egg and just a yolk for this recipe. vanilla extract -high-quality vanilla extract. I recommend Rodelle’s vanilla extract. flour – all-purpose flour will do the trick for this recipe! Be sure to not pack the flour in your measuring up and to always level it. cinnamon – cinnamon is the signature flavor for a carrot cake recipe. Make sure yours is still in date. It’s easy to forget that your spices do expire. baking powder – To activate baking powder, an acid (brown sugar in our case) is always required. Because most baking powders are now double acting, that means this batter needs to be baked right away. salt – salt helps balance the sweetness and contributes to the flavor! carrots – the carrots don’t need to be peeled but can be if you want. Use a box grater to for shredding carrots. cream cheese – always use full-fat cream cheese unless the recipe says otherwise. 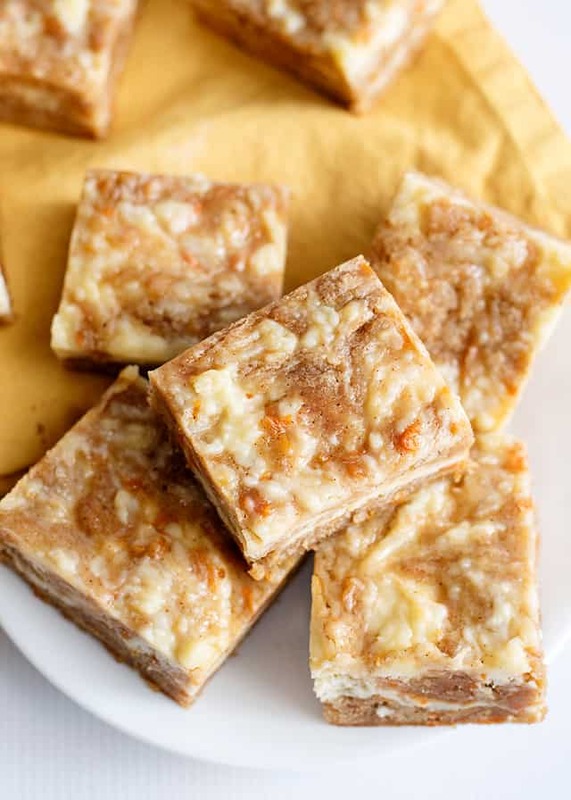 Now to make these carrot cake swirled cream cheese bars, begin by melting the butter and whisking it with the brown sugar in a large bowl. Add in the egg and vanilla extract. Whisk until incorporated. Add in the flour, baking powder, salt, and cinnamon. 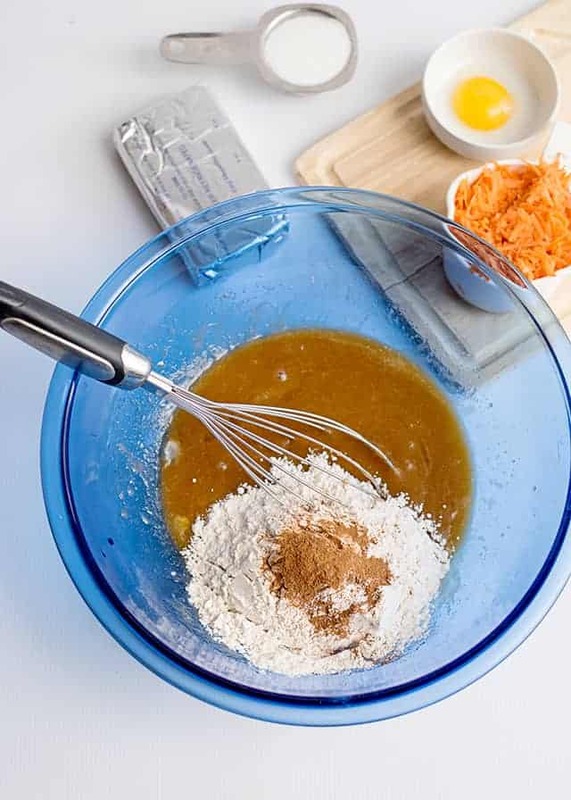 Whisk until the dry ingredients are incorporated and then fold in the grated carrots. For the cream cheese part of the carrot cake cream cheese bars, add the cream cheese, sugar, yolk, and vanilla extract into a bowl. Using a hand mixer, beat until smooth. Start with half of the carrot cake batter. 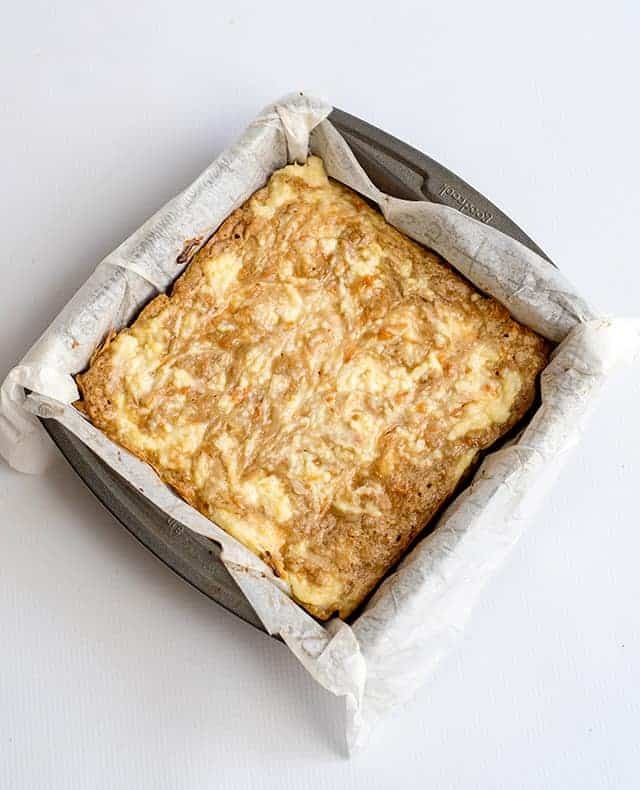 Begin pouring the batter into an 8×8 baking pan. Spread it out evenly. Add dollops of the cream cheese on top of the carrot cake batter. Add the remaining carrot cake batter on top and around the cream cheese. Add the remaining cream cheese in spoonfuls on top. 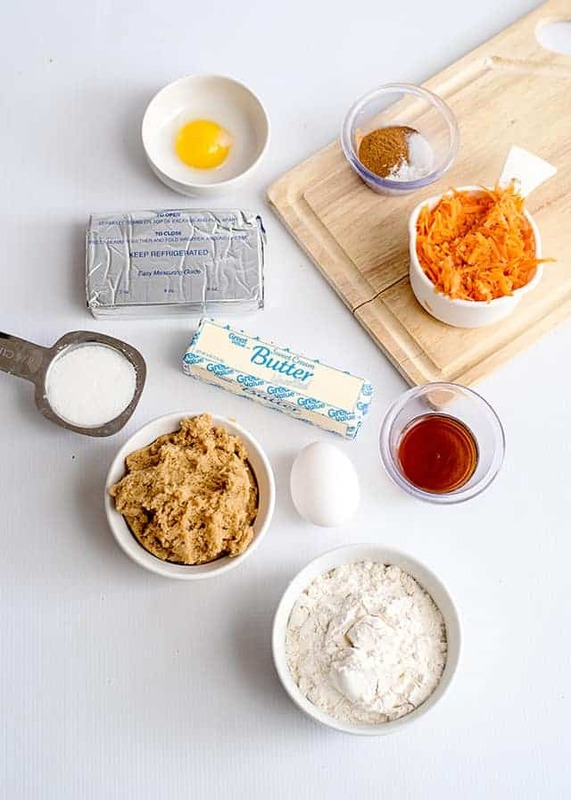 Using a skewer or butter knife, swirl the cream cheese into the carrot cake batter. Place into the preheated oven and bake for 35 to 40 minutes. These bars are loaded with cream cheese, so the best way to store them is in an airtight container and in the fridge. They will last 3 to 5 days and taste delicious straight out of the fridge. 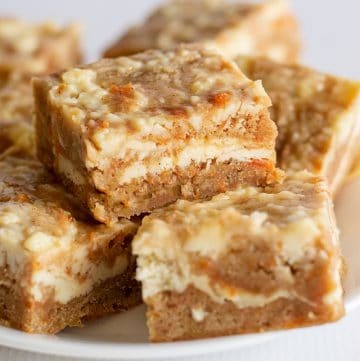 I have other great carrot cake squares to try too! Do you love browned butter? 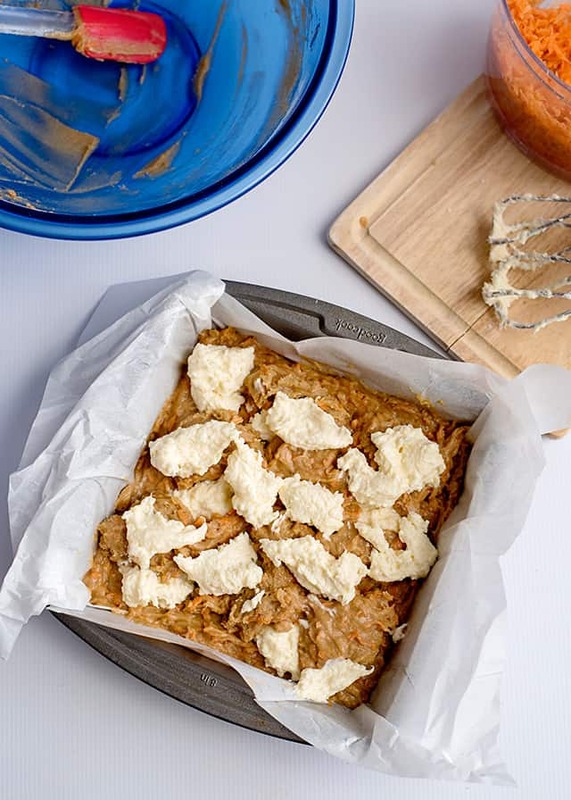 Check out this browned butter carrot cake blondies recipe. Preheat oven to 350 degrees. Spray an 8x8 baking pan with non-stick spray and set aside. Line the pan with parchment paper. Place the butter in a microwave-safe bowl. Microwave for 30 seconds. If needed, microwave another 15 seconds to melt the butter completely. In a medium bowl, add the melted butter and brown sugar. Mix to combine. Add in the flour, cinnamon, baking powder, and salt. Stir until completely combined. In a medium bowl, add in the cream cheese and sugar. Beat with a hand mixer until smooth. Add in the egg yolk and vanilla extract. Beat until smooth and creamy. 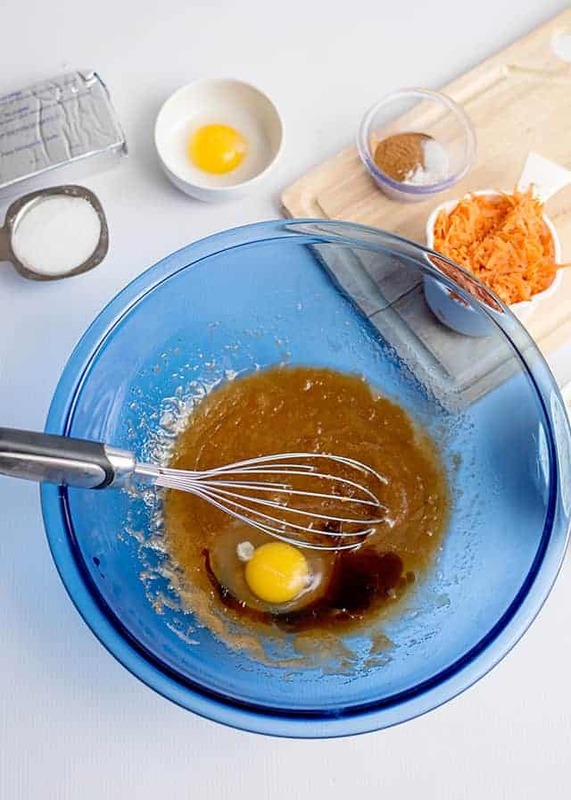 Add about half of the carrot cake batter into the pan and spread it out with an off-set spatula. Add half of the cheesecake batter to the carrot cake batter. Do this by dropping dollops of batter over the carrot cake batter. Don’t swirl yet. Add the remaining carrot cake batter on top of the cheesecake batter and around the cheesecake batter. 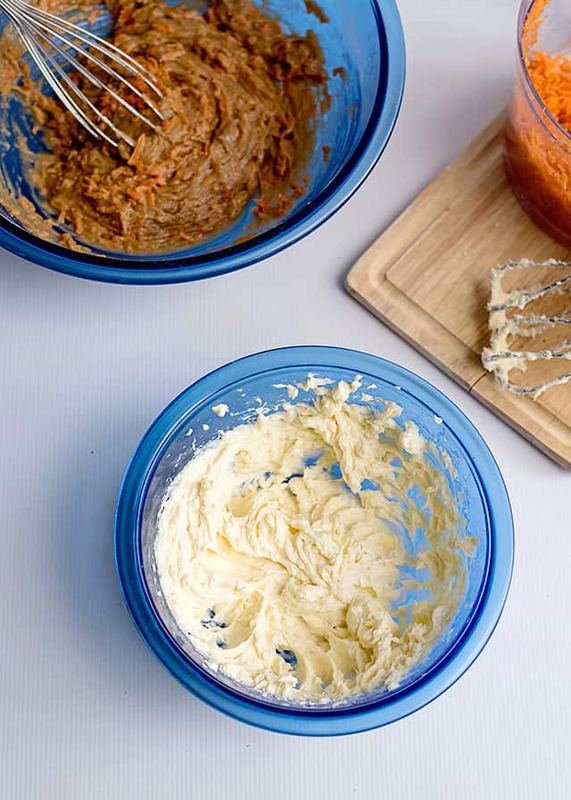 Add the remaining cheesecake batter by adding dollops on top of the carrot cake batter. Using a knife or skewer, swirl the batters together. 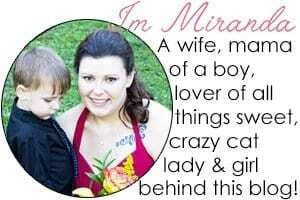 Swirl as much or as little as you like. Bake for about 35-40 minutes until the edges are golden brown. There will be very little jiggle to the center. Cool completely before cutting. Store in an airtight container in the refrigerator.